The Bharatiya Janata Party said Tuesday the Delhi Assembly election results were a “big setback” and it would soon introspect the reasons behind the dismal showing. The party also said that Delhi’s loss is a “collective failure” of the party and the defeat cannot be thrown on any single individual, seen as an attempt to deflect any blame on Prime Minister Narendra Modi. The party leaders while congratulating Arvind Kejriwal, hoped he will now fulfil the promises made to people and ensure development of Delhi even as the Centre promised to extend all its support to the new government. ”Election results for Delhi state is a setback for BJP. BJP accepts d(the) defeat in Delhi elections. We respect the verdict n(and) positively cooperate with Delhi government on d development,” Rao tweeted. He felt that Haryana elections, where BJP got a majority, has not impacted Delhi polls. “Why Delhi elections will impact BJP in other states”. ”Extending d Verdict of Delhi elections to unrelated issues is like stretching too far. Central govt performance was not d election issue,” he said in another tweet. Another BJP Spokesperson Nalin Kohli said the party will assess the reasons why the party failed to appeal to Delhi voters and hoped Kejriwal will fulfil all the promises made. ”It is a huge victory for AAP. BJP would certainly assess what were the reasons that we have not not been able to appeal to the voters of Delhi. We wish well for AAP for delivering on the promises made and give Delhi a good government,” he said. Party’s Delhi unit chief Satish Upadhyay admitted that the party failed to understand the mood of the people. Another party spokesperson G.V.L. Narsimha Rao said the polls were a referendum on Kejriwal and could not be seen as reflection on the performance of the Modi government as local issues dominated the polls. ”I do not see in this way,” he said when asked whether the elections were a referendum on Modi’s performance. ”In this election it was a referendum on Arvind Kejriwal. That’s how people of Delhi saw it. I think people have certainly voted for Kejriwal. It was a referendum of AAP’s 49 days in office and its performance. People felt they should be given a chance,” he said. BJP general secretary Ram Madhav has also congratulated Kejriwal for his victory in the Delhi polls. Congress president Sonia Gandhi and party vice-president Rahul Gandhi congratulated Arvind Kejriwal on Tuesday for Aam Aadmi Party’s landslide victory in the Delhi Assembly polls in which Congress failed to score. ”My congratulations to Arvind Kejriwal and Aam Aadmi party for their victory. The people of Delhi have chosen AAP and we respect that. I wish Kejriwal and his team the very best”, Rahul said. An All India Congress Committee statement said the Congress president and vice-president congratulated Kejriwal. Congress has failed to open its account in the 70-member House, prompting Ajay Maken, who was the party’s face in the Delhi polls, to resign from the post of general secretary, taking moral responsibility for the humiliating defeat at the hustings. Congress had won eight seats in the last Assembly polls in Delhi held in 2013, which had delivered a hung verdict. Congress had lost power in those elections after being at the helm for 15-long years under the leadership of Sheila Dikshit. The capital was without a government for almost a year and the vote to elect a new set of lawmakers was much more than local politics. The state poll turned into a battle between Indian Prime Minister Narendra Modi’s Bharatiya Janata Party and the anti-corruption campaigner Arvind Kejriwal of the Aam Aadmi Party. 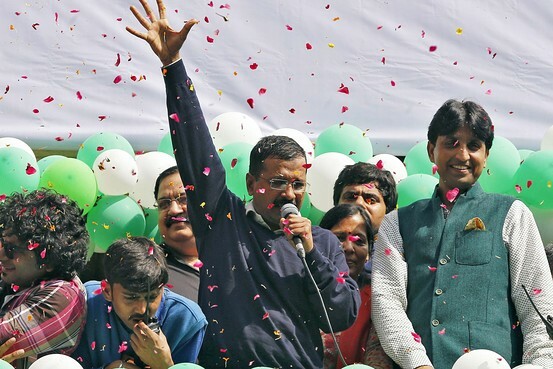 AAP declared a wholesale victory on Tuesday spelling the first major setback for a BJP electoral juggernaut that started with a victory in the national parliamentary vote in May. AAP won over 90% of the seats in the state assembly. Mr. Kejriwal will be sworn in as chief minister on Feb. 14. The BJP won three seats. Congress, that ruled Delhi for 15 years until 2013, won no seats. India’s Prime Minister Narendra Modi called Arvind Kejriwal to congratulate him on his party’s victory in the city. 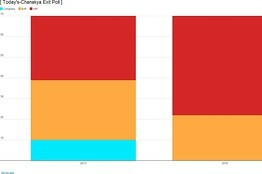 Why is the election happening now just over a year since the previous state poll? You might not have noticed, but India’s capital city has not had an elected government since February last year when Arvind Kejriwal quit after just 49 days as chief minister. The national capital has since been under president’s rule, awaiting either a different government to take charge or another round of elections. The first option proved difficult because no party had won a majority. The Bharatiya Janata Party came first followed by the Aam Aadmi Party leaving Congress a distant third. AAP formed a government with support from the Congress. After Mr. Kejriwal stepped down, no other coalition emerged. Months of consultations later, the state’s lieutenant governor recommended fresh elections in Delhi, which were held on Feb. 7. Results are announced today. The opinion polls and exit polls have had their say and given the lead to AAP. But they’ve been wrong before. 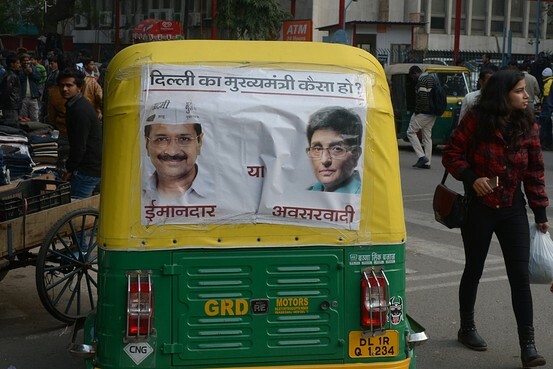 Who do you think will win Delhi elections today? 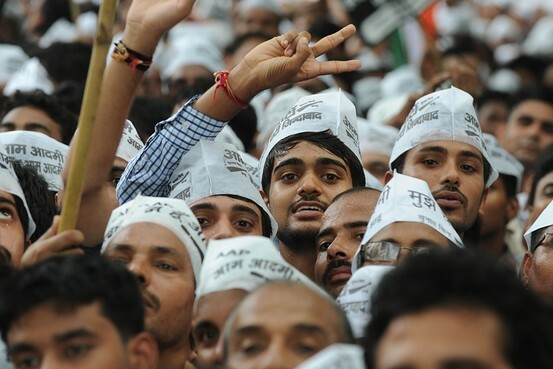 Most exit polls released on Saturday suggested a comfortable majority for the Aam Aadmi Party. Some predicted a sweeping one. A poll by ABP News gave AAP a 17-seat lead over the BJP saying it would win 43 of 70 seats in Delhi’s legislative assembly. The poll said the BJP would trail with just 26 seats. Another poll, by the India Today media group, gave between 38 and 46 seats to AAP and only 19 to 27 to the BJP. If they hold true, this would be the first electoral bloody nose for Prime Minister Narendra Modi’s party since they stormed to power in federal elections in May. Delhi has just outvoted itself. In 2013, a record 65.13% of voters cast a ballot. On Saturday, 67.11% of the 10 million registered voters turned out, breaking the previous year’s record. While close to 9 million people voted in the Delhi elections. The union territory and its nearby suburbs make one of the biggest clusters of humanity in the world. A World Bank Report last year put the region’s population at around 25 million people, ranking it the second-most populous city in the world after Tokyo. 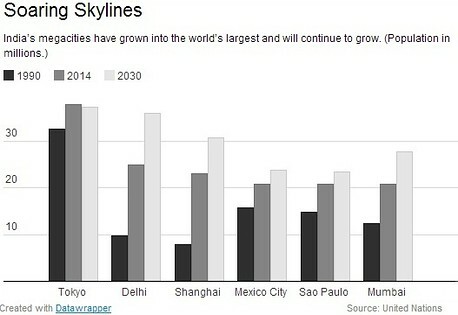 Delhi is likely to add another 10 million inhabitants in the next 16 years, the report said. The Aam Aadmi Party’s Arvind Kejriwal was up early asking for people’s prayers on Twitter as Delhi awaits election results. BJP chief minister candidate Kiran Bedi spared a thought on Twitter for the poor hacks up at the break of dawn to cover the election results. “I don’t think anyone can envy the media profession,” she tweeted. How Reliable Are Exit Polls? According to most exit polls from Saturday’s vote, the Aam Aadmi Party is headed for victory in the state election when results are announced today. Exit polling can be unreliable in India but it’s worth looking at which ones got it right last time round during state elections in 2013. News 24 -Today’s Chanakya poll came the closest. It predicted the Aam Aadmi Party would win 31 seats. In fact, AAP won 28 of 70 seats and formed a government with support from the Congress party. 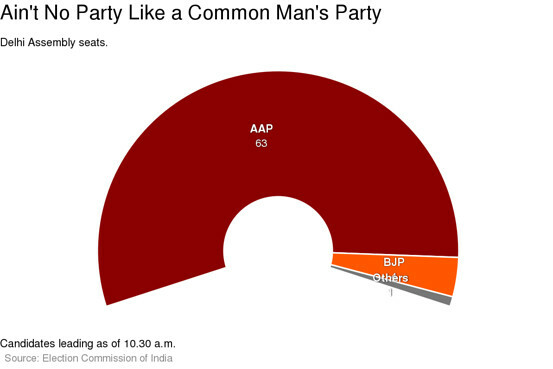 In the exit poll released Saturday, Chanakya predicted AAP would win a clear majority with 48 seats. An exit poll released by ABP News, a news station, and a survey conducted by Nielsen in 2013 predicted a slim majority for the Bharatiya Janata Party and only 15 seats for the upstart Aam Aadmi Party. The minimum number of seats required to govern the 70-member Delhi assembly is 36. For the 2015 election, the poll predicts AAP will do much better with 39 seats and the BJP will win between 37 to 28 seats. When polls closed at 6 p.m. on Saturday, the more than 12,000 electronic voting machines were put under lock, key, CCTV, and police guard. Then, this morning, they were taken to 14 different counting centers that each have several counting halls where counting supervisors and their assistants press the “result button” on each machine. The layout inside a counting hall looks something like this. 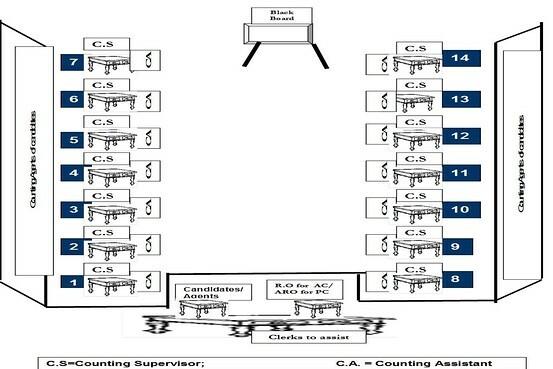 Counting can run into several rounds and is sometimes repeated before the returning officer announces the winner and final tally for each candidate. 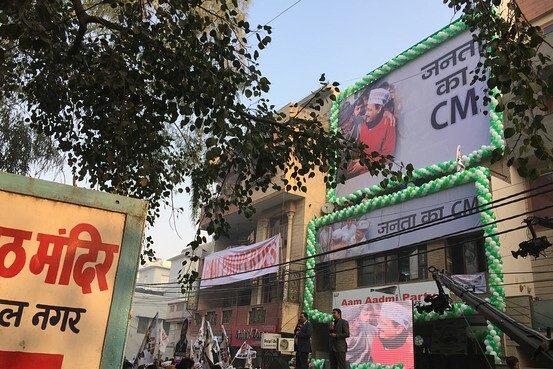 Many observers said the campaign to capture control of Delhi was uglier than most political campaigns. There were a lot of personal attacks and some mud-slinging, often through pamphlets stuck in newspapers. As part of its campaign, the BJP built more than 1,000 selfie-with-Modi booths–many of them on the back of little trucks–which set up in shopping malls, parking lots and street corners across the state. They let people take selfies using an app that made it look like they were standing with the prime minister. 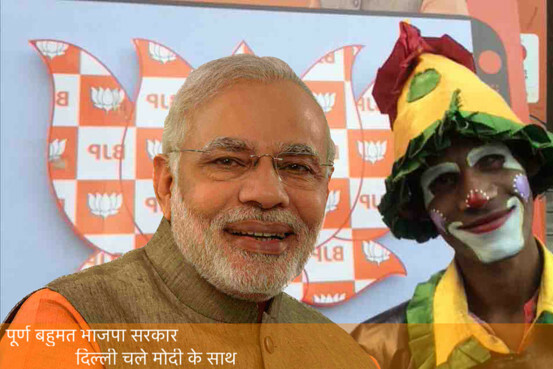 The BJP says that over half a million selfies were taken at the booths. Unlike previous state elections, where Mr. Modi focused largely on his development agenda, the Indian Prime Minister ran a direct attack campaign against Mr. Kejriwal. In rallies, Mr. Modi accused the AAP leader of dishonestly accumulating money for his campaign. The allegations against AAP – that some of its funds come from shell companies involved in money laundering — have not been investigated. Yogendra Yadav, a senior AAP leader has said that the party would “investigate shady companies” giving it money. In the end, in this David and Goliath-style struggle, Mr. Modi came off as trying too hard to bring Mr. Kejriwal down. Power and property shares fell Monday after exit polls over the weekend suggested the AAP could capture majority control of Delhi’s assembly. Some analysts and investors are worried that the party of the protesting politician Arvind Kejriwal could cause trouble for companies in the capital region. Power companies and property companies in particular could be hurt, analysts say, if Mr. Kejriwal comes to power and tries to implement policies to lower voters’ electricity bills and rents. Why it Matters: Arvind Kejriwal, Delhi’s former chief minister, is again running for office from the elite New Delhi constituency. In 2013, Mr. Kejriwal triumphed here, defeating the Congress party’s Sheila Dikshit, at the time the incumbent chief minister. This year, Mr. Kejriwal was challenged by the BJP’s Nupur Sharma, a former president of the Delhi University Student Union and a law graduate from the London School of Economics. Why it Matters: Kiran Bedi, the BJP’s chief ministerial candidate, is contesting elections from east Delhi’s Krishna Nagar constituency. The constituency has been dominated by the BJP for more than two decades. A post-poll analysis by The Hindu, an Indian English-language daily newspaper, suggested that Saturday’s turnout in Krishan Nagar was about 72%, up from 68% in 2013. Why it Matters: The beleaguered Congress party’s star campaigner, Ajay Maken, a former member of parliament, is running from central Delhi’s Sadar Bazaar. In 2013, the Aam Aadmi Party won the seat — defeating a Congress party candidate who had won the seat since 1993. That didn’t take long. Vijender Gupta of the BJP is leading in Rohini, in outer Delhi, according to NDTV. The first lead in counting that began at 8a.m. with postal votes. While the Bharatiya Janata Party has been quick to say the Delhi elections are not a referendum on Prime Minister Narendra Modi’s first eight months in office, the ruling party was not shy about putting Mr. Modi’s photo on most campaign advertisements. But is this election a referendum on Modi? This question will be hotly debated in television studios and outside if the BJP loses the election. The party has credited a wave of support for Mr. Modi and his development agenda for its recent electoral victories. So, is a defeat in the center of power indicative of his waning popularity, or a comment on his government’s economic program? The BJP’s spokespeople have preempted this line of questioning. Shaina NC of the BJP said “results in Delhi can’t be linked to the Prime Minister’s work.” And the BJP’s chief ministerial candidate in Delhi, Kiran Bedi, said in televised statements last week that she would take responsibility for the party’s performance, an apparent effort to shield Mr. Modi from criticism. To be sure, political analysts also say Mr. Modi remains overwhelmingly popular in other parts of the country and that Delhi’s elections reflect local issues rather than national preferences. Still, if the BJP loses, questions about whether the Modi wave is beginning to plateau will surface. Rakhi Bidlan of AAP is leading in Mangol Puri, outer Delhi according to NDTV and Somnath Bharti leads in Malviya Nagar. So, according to leads on T.V., it’s two all. As counting began, hundreds of AAP supporters—from rickshaw-pullers to young students—gathered outside the party’s office in the western reaches of the capital. The song “Long Live Revolution” blasted from loudspeakers. AAP’s Arvind Kejriwal seems unperturbed by early results showing a close race with the BJP. While waiting for election results he’s watching, and sharing, parody videos of himself. 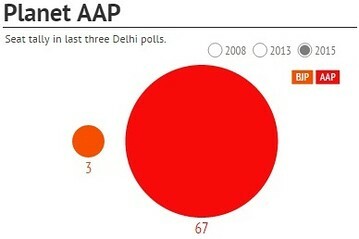 In its debut election, the Aam Aadmi Party had quite a showing. It won 28 of the 70 seats it contested. Most of the support, at the time, came from the southern and central parts of the national capital, home to the city’s upper and middle classes. But Mr. Kejriwal managed to leave these groups that backed him slightly miffed when he decided to quit office not even two months into the job. This time, analysts say, he is set to gain from the city’s poor and lower-income communities, or the “urban underdogs,” who seemed pleased with Mr. Kejriwal’s short stint as chief minister when he cut electricity and water prices. The former police officer known for her fight against corruption might be a right fit for Indian politics. But she appears to have become a victim of being in the wrong place at the wrong time. Parachuted into the BJP just three weeks before the election, Ms. Bedi was quickly declared the party’s chief ministerial candidate. That decision set off discontent among the BJP’s longtime leaders who felt upstaged by the newcomer. If the polls are correct and the BJP don’t win today, Ms. Bedi could be made the scapegoat. Arvind Kejriwal’s campaign against corruption has not only been aimed at politicians and bureaucrats. The AAP has said it plans to cut power prices in Delhi in half by looking into the books of the big power companies for proof that they are pocketing too much profit. The Bharatiya Janata Party’s chief minister candidate, Kiran Bedi, made her name as a high-profile police woman. She worked in the narcotics bureau, the northeastern state of Mizoram and as inspector general of Tihar jail. Ms. Bedi is widely credited with turning around the jail and introducing significant reforms to the treatment of prisoners,including introducing yoga and meditation programs for inmates. Mr. Kejriwal too spent time in Tihar. He was arrested in 2014 and sent to the Delhi jail briefly after a senior BJP politician accused him of defamation. Mr. Kejriwal denies the allegations. In Delhi, is AAP the New Congress? 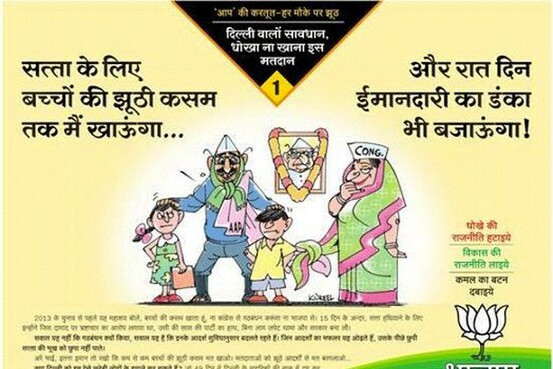 Mr. Kejriwal denies his party is left-leaning with a welfare-oriented bent. But his policies, including cheap electricity and free water, and his promise to take on Delhi’s large power distribution companies, have given AAP a pro-poor image. That used to be the Congress party’s territory. But exit polls suggested Congress has lost considerable ground among India’s poor communities and its sway with disadvantaged caste groups has declined. A poll by the India Today group suggested that support for the Congress in groups the organization classifies as “working class” and “lower middle class” has shrunk to roughly 16% while nearly 45% of such voters preferred AAP. According to an exit poll by Today’s Chanakya, an Indian survey company, 55% of votes of Delhi’s lower castes went to AAP, with Congress getting less than 10%. Donations to AAP are rather like its political fortunes — up and down. After the party fared poorly in national elections, funding almost dried up. On one day in October last year just 713 rupees was donated to the party. But in recent weeks, as AAP has regained popularity among voters, donors have begun to open their wallets again and funding for the party has soared. At around 8:30 a.m. the common man’s Party was ahead in the earliest vote tallies, leading in the contests for 10 seats in the Delhi elections compared to BJP’s 9 seats Congress’s 2 seats. – Which Way did Delhi’s Middle Class Vote? A key demographic that political pundits will be watching is the middle class vote. According to a study of the 2013 state elections in Delhi by the Center for the Study of Developing Societies, a New Delhi-based think tank, a third of voters it classified as middle class – who earn between $250 and $380 a month – picked AAP. Some political analysts believed these voters had turned against Mr. Kejriwal after he quit just 49 days into his term as chief minister last year. Many of them had begun to see him as an anarchist and a rabble rouser. But, if AAP wins the kind of broad victory exit polls are projecting for it, it appears many among Delhi’s middle class may have wanted to give Mr. Kejriwal another chance. While Arvind Kejriwal seemed to have become a bit more calm and confident in this campaign, in the run up to the previous election and even during his brief stint as chief minister of Delhi, he did not shy away from creating chaos. He led protests, staged a roadside sit-in and even called himself an anarchist. Some of the first shots fired in the battle between Arvind Kejriwal and Kiran Bedi—former anti-corruption movement buddies—were through Twitter. Not long after it was announced that the former police woman was running with the BJP for chief minister, Mr. Kejriwal took to Twitter to challenge her to a debate and then ask why she had blocked him. The television news station CNN-IBN Live says political pundits are claiming they will be able to call the election as early as 9 a.m. The station shows the Aam Aadmi Party leading in two constituencies with the Bharatiya Janata Party and the Congress Party following with one each. Aam Aadmi party leader Somnath Bharti is currently leading from south Delhi’s Malviya Nagar constituency, according to NDTV. He became a controversial figure for actions he took as the state’s law minister during AAP’s brief period in power last year. He ordered police to search a house in Delhi’s Khirki Extension that he suspected was a brothel. Mr. Bharti and his aides detained four Ugandan women at the scene after police said they lacked a judicial warrant for a search. The episode stiffened ties between India and Uganda, and prompted some African immigrants to move out of the Indian capital. This is what he’s seeing. AAP is leading in 20 seats. The party needs 35 to win a simple majority. The BJP has 10 early leads in the city and Congress five. The December 2013 elections left the state with a hung assembly. Of the 70 seats, Aam Aadmi Party got 28 back then, Bharatiya Janata Party got 31, Congress got 08 and Janata Dal (United) and Shiromani Akali Dal got one each. There was also one independent candidate that won a seat. As the results come in it’s becoming clear that it will be hard for the BJP to catch up to AAP’s lead. WSJ columnist Sadanand Dhume tweets that the only question left is when the BJP will admit defeat. India’s many television news channels are all working hard. Even before results have come in, their screens are stuffed with statistics. Headline Today’s screen barely had space for the news anchor. If Congress proved to be an underperformer in the previous Delhi elections, it has been something of a non-entity in this one. 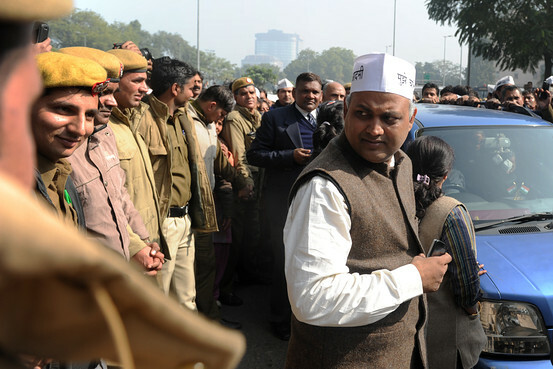 The party, which governed Delhi for 15 years before the 2013 polls in the national capital, ran a lackluster campaign. It won a fourth of Delhi’s votes in the previous election – at the time that was considered a dismal performance for the party. This time around, its vote share could fall below 15%, exit polls say. Its tally of seats in the legislative assembly could drop from 8 to below 5. The reason? Polls show Congress may have lost support among its most-loyal constituencies: the city’s poor and Muslim residents. Delhi has been waiting for an election for nearly a year since Mr. Kejriwal stepped down as chief minister in February 2014. The BJP could have called for one at any time after it swept the national vote in May last year. Mr. Modi and his team may have waited too long and missed the Modi wave. Political analysts say the BJP would have been better-placed if it had gone to the polls in Delhi shortly after the nationwide vote in which the party won a historic victory. AAP, on the other hand, won only four of 543 seats in that election and lost all seven seats in Delhi. The fledgling party looked weak and out of depth then. But in the months that followed, it regrouped to prepare for the Delhi vote. First, it would put the brakes on the BJP’s winning spree. Since the party won a landslide victory in national elections in May, it has won state elections in Haryana, Jharkhand and Maharashtra as it seeks to expand its base outside its traditional strongholds. Second, a loss would hamper Mr. Modi’s efforts to consolidate his party’s position in the upper house of India’s Parliament where his political opponents, who are in the majority there, are obstructing his policies. Third, it would come as a personal embarrassment for Mr. Modi, who campaigned extensively in this election and governs the country from Delhi, and dent his image as India’s most-popular leader in recent years. Fourth, it could embolden opposition parties at the federal level and in states, where his political dominance has overshadowed other political players. “A victory for the BJP would reaffirm Prime Minister Narendra Modi’s countrywide popularity,” she said. For the first time, Delhi is witnessing a direct two-way contest between the Bharatiya Janata Party and Aam Aadmi Party. The Congress party, which ruled Delhi for 15 years until December 2013, has trailed badly this time in exit polls. We read AAP’s manifesto so you don’t have to. High on its agenda is to pass the Jan Lokpal bill, the anti-corruption legislation that Mr. Kejriwal couldn’t get through the assembly in 2014, leading to his resignation as chief minister. Sandeep Shastri, a political analyst on CNN-IBN said that so far it looks like the Aam Aadmi Party did a better job of choosing new candidates this time. Early results suggest that AAP is winning in the constituencies where AAP picked different candidates than those that ran in 2013. The Bharatiya Janata Party has not done as well with its new candidates. The Election Commission’s official website just flashed the first preliminary results, showing that AAP’s Som Dutt is leading in the central Delhi constituency of Sadar Bazar. Ajay Maken, who led the campaign for the Congress party, is trailing there by more than 3,400 votes. Meanwhile, television news channels are projecting a big overall lead for AAP. NDTV says AAP is leading in 32 of 70 assembly constituencies. What Happened to the WagonR? He was rarely photographed without it during his first campaign for Delhi. He even held meetings with his ministers in the boxy, blue vehicle. But Arvind Kejriwal’s trusty WagonR—the car that connected him with the common man—has been out of the picture in recent weeks. Did it break down? Has he started using Uber instead? We want to know—what happened to the WagonR? Ms. Bedi is contesting from Krishna Nagar, where she is leading, according to CNN-IBN and NDTV news stations. After national elections in May, Arvind Kejriwal—who used to make headlines daily—all but disappeared from the media. 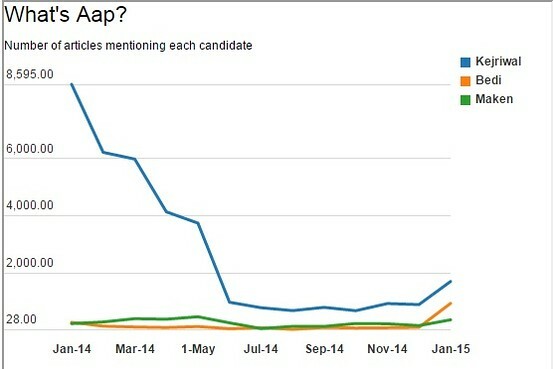 The tally of the total number of English news articles he was mentioned on in on Factiva shows he was largely ignored during the second half of 2014. He started making a comeback however in early January. Early results being broadcast on NDTV suggest that AAP is ahead on the votes for 36 seats giving it a majority at around 9:00 a.m. while BJP is only ahead on 12 seats. Meanwhile the Congress party is ahead in the races for 4 of the 70 Delhi assembly seats. India’s stock market braced for another weak day as the Aam Aadmi Party looked likely to get majority in Delhi state elections. The benchmark S&P Sensex index has already lost 5% in the last week after various exit polls showed the Bharatiya Janata Party trailing in the race to govern the national capital. 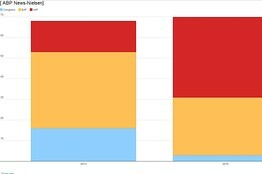 It ended down 1.7% Monday. “Traders are disappointed and shocked as the market was not expecting this kind of verdict,” said Vinod Nair, head of fundamental research at Geojit BNP Paribas Financial Services. An AAP win will likely hit power and real-estate companies operating in the Delhi region, analysts said. has promised to cut electricity tariffs. 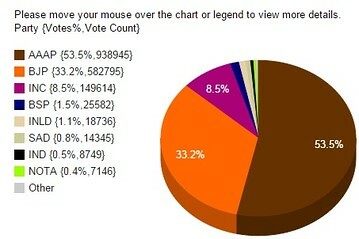 Trends on the Election Commission website look good for Aam Aadmi. 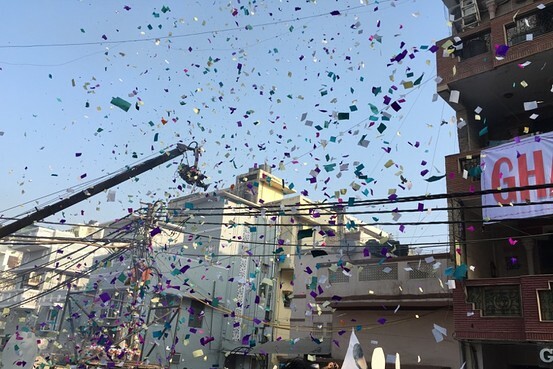 AAP is now leading in 24 constituencies, according to the commission, including east Delhi’s Krishna Nagar, from where the BJP’s chief ministerial candidate, Kiran Bedi, is running for office. Ms. Bedi is almost 300 votes behind AAP’s S.K. Bagga. Take a look at this pie chart from the Election Commission, which shows the vote-share for each party as vote-counting continues. by Modi’s Suit to Blame? Author Chetan Bhagat said the pin-striped suit which Prime Minister Narendra Modi wore during President Barack Obama’s visit in January is partly to blame for the defeat that the Bharatiya Janata Party is facing in the Delhi election. “That suit has not gone down well,” said Mr. Bhagat on a local television broadcast. 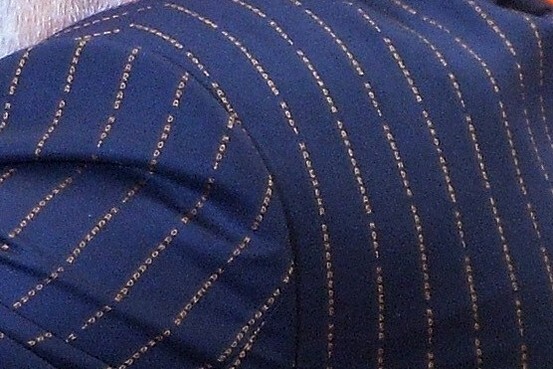 The gold stripes in Mr. Modi’s navy blue Indian jacket and pants were not simple stitching. They were Mr. Modi’s name. Over and over again, the lines repeated the name: Narendra Damodardas Modi. Mr. Modi’s middle name is his father’s first name. From just a few dozen volunteers this morning to scores of supporters now, the scene outside the Aam Aadmi Party office has begun to resemble that of a crowded Indian festival. Loudspeakers blast revolutionary tunes in the background, while supporters light firecrackers to celebrate the party’s lead. Rajdeep Sardesai, a journalist on the Headlines Today television news station, says the results coming in show that both high-income and low-income neighborhoods in Delhi have voted for the Aam Aadmi Party. Promising subsidies for the poor—such as reduced electrical bills, and increased water supplies in areas without running water—may have worked in favor of AAP, says Mr. Sardesai. 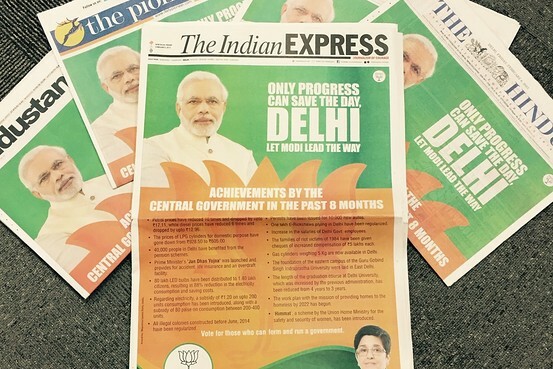 “What we said, we can deliver over the next five years,” says Meera Sanyal, an AAP spokeswoman. In the 2013 assembly election, predominantly central and south Delhi voted for AAP—that is, mostly middle to upper-class neighborhoods. The BJP is starting to spin the results that show AAP in the lead. “This is a localized election,” said BJP Spokesman G.V. L. Narsimha Rao. 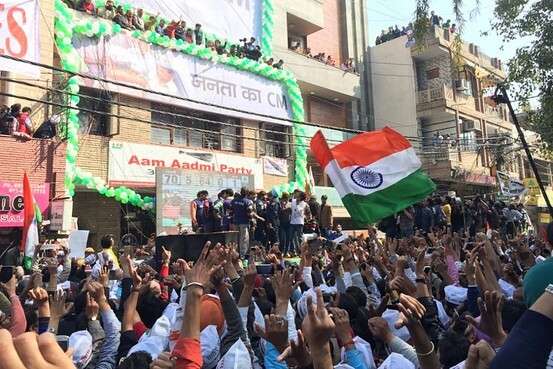 Celebrations are in full swing at the Aam Aadmi Party office. According to the Election Commission, the party is leading in 41 of the Delhi’s 70 assembly constituencies. West Bengal Chief Minister Mamata Banerjee tweeted congratulations to Arvind Kejriwal as election results seem to indicate a clean sweep for the Aam Aadmi Party. Ms. Banerjee’s Trinamool Congress Party and other regional parties have thrown their weight behind AAP in recent weeks. Trinamool will face its own challenge from the BJP in 2016 when the state goes to the polls. The Aam Aadmi Party is now leading in 49 seats of 70 in the Delhi assembly, according to data available on the website of NDTV. That’s a seat each for the 49 days of AAP’s last term in power. It suggests that Arvind Kejriwal’s apology for his previous 49-day-only government may have paid off. Congress says there is no anger against the party. “The weather has changed in Delhi. 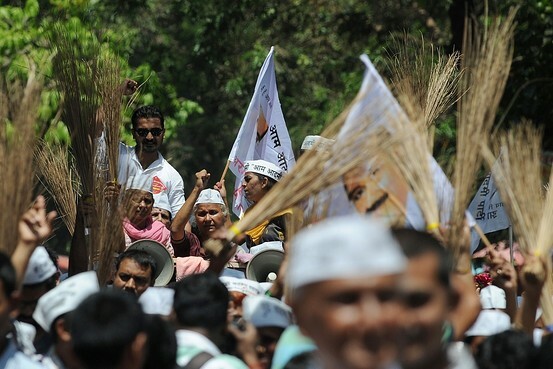 The broom has swept the lotus away,” an Aam Aadmi Party supporter announces, a reference to the rival BJP’s party symbol. The crowd goes wild. Party volunteers begin handing out brooms, the electoral symbol of the AAP, to excited supporters. 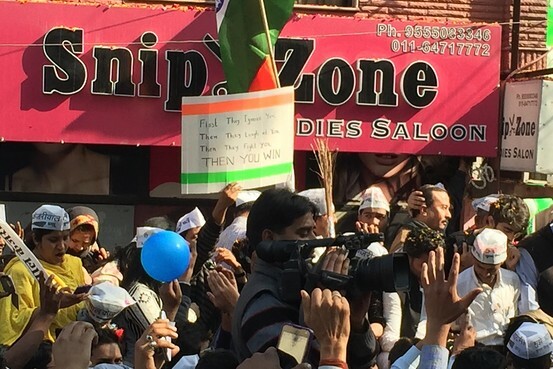 “Come, let’s clean up the mess in Delhi,” a young supporter screams. The counting of votes for Delhi election should be over by 12 p.m. “We should know who will form the next Delhi government by early afternoon,” an official at India’s election commission said. At 9:25 a.m., Election Commission results showed the Aam Aadmi Party leading in races for 41 of Delhi’s 70 assembly seats. The Bharatiya Janata Party was leading in seven constituencies. The Congress party, which held power in Delhi for 15 years before losing elections in December 2013, was trailing everywhere. He criticized Mr. Modi for making the vote a “referendum on himself.” But Mr. Yadav cautioned that hype could be damaging for the party going forward. “The hype around AAP actually damaged us last time,” he said. Questions are being asked on the television station CNN-IBN about the status of Congress as a national party as the party trails Aam Aadmi Party and the Bharatiya Janata Party in the Delhi election. The news station shows zero seats for Congress with the BJP leading in around 10 seats and AAP leading with more than 50 seats. “There is something called incumbency and that has affected us,” says Brijesh Kalappa, Congress party spokesman. Manmohan Singh’s former spokesman, Pankaj Pachauri, congratulated the Aam Aadmi Party for its looming victory in the Delhi elections. The former Congress-led government’s spokesman had nothing to say about dismal showing by the Congress in the election. Biggest Swing for AAP in Badarpur? The Aam Aadmi Party had a poor showing in 2013 in south Delhi’s Badapur constituency, where it lost to the BJP by more than 20,000 votes. This year, Badarpur seems to be the constituency where AAP has managed to climb the ladder to the top in the most spectacular manner. 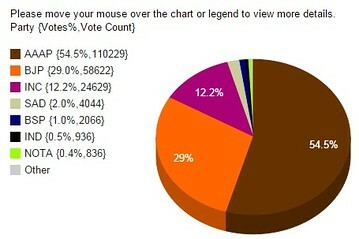 Its candidate, Narayan Dutt Sharma, is leading by more than 21,000 votes. As counting continues, this seems to be the maximum margin the AAP has managed among the 55 constituencies where it is leading. The Times Now television broadcast is reporting protests outside the Congress party’s office, including chants of “Bring Priyanka back.” Priyanka Gandhi is the daughter of Congress party chief Sonia Gandhi and the late Rajiv Gandhi, prime minister from 1984 to 1989. Her great-grandfather was independence leader Jawaharlal Nehru, India’s first prime minister. Her grandmother, Indira Gandhi, served as prime minister for 15 years in two stints. But it is her brother, Rahul, who is the vice-president of the Congress party. “The only hope for the Congress party is Priyanka Gandhi,” says Arnab Goswami, a journalist on Times Now. The latest numbers suggest that AAP could win more than 80% of the seats of the Delhi Assembly. The NDTV tally at around 10:00 a.m. shows AAP leading on a whopping 59 out of the 70 seats. The BJP is a distant second, leading in 10 seats while Congress was ahead on no seats. When Arvind Kejriwal first ran for office from the elite New Delhi constituency, he zoomed past Delhi’s three-time chief minister Sheila Dikshit by more than 25,800 votes. While counting is still in progress, Mr. Kejriwal’s lead doesn’t seem as impressive as last time, he’s heading the charts with about 3,500 votes more than his immediate competitor from the Bharatiya Janata Party. Nonetheless, his party is on a great run leading in 58 of the 70 assembly seats, according to the Election Commission. The official vote-share of individual parties, as it stands now. Arvind Kejriwal has given his first interview since results showed his party was leading in state polls. “This is not my election it was the people’s election, I will show that the people are with me,” Mr. Kejriwal was quoted by the TV channel as saying. “We will concede defeat, just a matter of time,” Mr. Kohli said in an interview with The Wall Street Journal. The final results are expected to be announced by noon. A defeat would be a major blow for Prime Minister Narendra Modi and his BJP, which is in power at the national level and had campaigned energetically to win in the national capital. The Aam Aadmi Party has begun celebrating its lead in a quintessentially Indian way: by rolling out a dholak, or a traditional Indian drum. 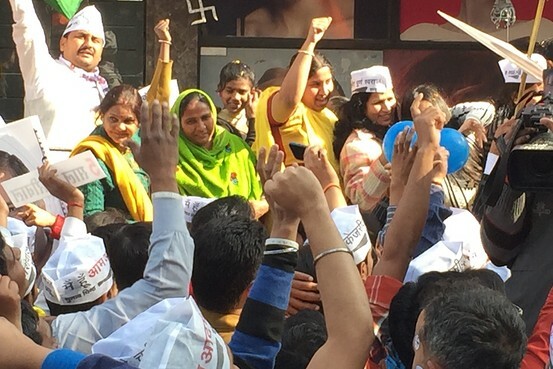 Housewives clad in saris and domestic workers holding brooms, AAP’s symbol, are among those dancing to the beats. BJP chief ministerial candidate Kiran Bedi tweeted her congratulations to former colleague and Aam Aadmi Party leader Arvind Kejriwal. “Now take Delhi to the heights it belongs to,” she tweeted. At 10:36 a.m. Ms. Bedi was trailing in her constituency Krishna Nagar. “This is not a victory for the Aam Aadmi Party,” Yogendra Yadav, a senior AAP leader, says outside the party office. “It is a victory for the aam aadmi,” or common man. The crowd roars. “Hail India,” they chant in unison. Best-selling author Chetan Bhagat apologized on Twitter for mocking the Aam Aadmi Party in the past. Mr. Bhagat is particularly popular among India’s young people, who voted for AAP in droves. Mr. Bhagat instead turned his sharp tongue toward the BJP, noting that the party’s contingent in the Delhi state legislature looks to be so small, it could travel together in a single minivan. Of the 70 seats in Delhi’s state assembly, the BJP is now leading in only three, according to latest numbers from the Election Commission — and the Aam Aadmi party is looking to win in 66. The Congress party appears nowhere in the tally. In this picture, AAP supporters celebrate the stellar lead in 66 seats. Juggernaut is a word with origins in Indian history. The mid 19th-century term describes a large or heavy vehicle, or something with overwhelming force. It comes from the giant wheels of chariots carrying the Hindu deity Krishna that are annually rolled during a procession from the Jagannath temple in the state of Orissa. The BJP is leading in three seats, meaning that the MLAs could share an auto-rickshaw to work. The Bharatiya Janata Party looks set to lose so badly in the election, it might not qualify for the right to name the official opposition leader in Delhi’s state assembly. The BJP’s drubbing in the election appears to be leaving it with fewer than 10% of the 70 seats in the state legislative assembly. So, even though it would be the second-largest party in Delhi’s state assembly, behind the Aam Aadmi Party, its share of seats would be too small to qualify as official opposition leader. “The general rule is to get 10% of the seats in the state assembly, or a minimum of 10 seats,” constitutional expert Subhash C. Kashyap said. At 10:55 a.m., the BJP was leading in three seats in Delhi’s 70-seat state assembly. The AAP was leading in 66 seats, according to Election Commission of India website. Rajeev Talwar, managing director of India’s largest property company, DLF Ltd., welcomed Arvind Kejriwal’s victory in Delhi. “It’s a change in the nation, a new generation is coming in,” he said. Property and power shares have been sliding this week on concerns about AAP’s win. Investors and analysts are worried that Delhi’s new ruling party’s suspicion of big, profitable companies could lead to restrictions on how property and power companies do business in the capital. The shares of DLF had fallen as much as 2% Tuesday morning. Manish Sisodia, a member of the Aam Aadmi Party who is contesting the Delhi state election says “it is a victory for honesty” as latest numbers suggest that AAP could win more than 90% of the seats. Mr. Sisodia, who is contesting from the Patparganj constituency, is leading by 10,000 votes, according to the Election Commission of India. AAP party chief Arvind Kejriwal in his first interview since results showed his party was leading vowed to “end the culture of bribery,” according to the Indian channel NDTV. With just three candidates leading in the Delhi assembly race, the BJP is “now a ‘Nano’ party with enough room for a chauffeur,” one joker quips–a reference to that most un-BJP of rides, the diminutive Tata Nano. The stretch leading up to the Aam Aadmi Party’s headquarters is now flooded with a sea of supporters. Doctors, teachers, day-laborers and domestic workers are among those shouting slogans praising party leader, Arvind Kejriwal. “Paanch saal Kejriwal. Paanch saal Kejriwal,” the crowd chants, which, in English, loosely translates to “Kejriwal for five years.” Five years is the tenure of a chief minister in Delhi. The daughter of India’s President Pranab Mukherjee, Sharmishtha Mukherjee, ran her debut election this year from south Delhi’s Greater Kailash constituency. She represented the Indian National Congress, which might help you guess how she has fared. According to the most recent numbers from the Election Commission, Ms. Mukherjee is way behind both the AAP and BJP candidates. Last year, the seat went to AAP’s Saurabh Bharadwaj, who is currently leading with more than 42,000 votes. He said the BJP made promises to tackle corruption but “didn’t fulfill them.” “People believe Arvind will fight for them,” he said on CNN-IBN television news channel Tuesday. Mr. Hazare shot to public attention and became an icon for India’s middle classes when he went on a hunger strike in 2011 to demand tough anti-corruption laws and in particular a law to create an ombudsman to deal with allegations of corruption. He advised Mr. Kejriwal to remain simple. “The more you remain simple, the more people will have faith in you,” Mr. Hazare said. Man with @bjp Twitter Handle Wakes Up to Bombardment of Tweets. Again. John P. Brennan whose Twitter handle is @BJP said he was getting “blown up” with mentions on the micro blogging site on Tuesday. One assumes he was bombarded by tweets when the BJP led by Indian Prime Minister swept the national election in May. The party is set to take a drubbing in the Delhi election, with a lead in only three seats. AAP Chief Arvind Kejriwal has just made an appearance outside the party headquarters. “When you walk on the path of truth, the whole universe gets together to make good things happen,” Mr. Kejriwal says. The crowd cheers. Aam Aadmi Party Chief Arvind Kejriwal has criticized Mr. Ambani in the past as well. Mr. Ambani’s company, Reliance Industries, has previously denied any wrongdoing on its part or its chairman’s. 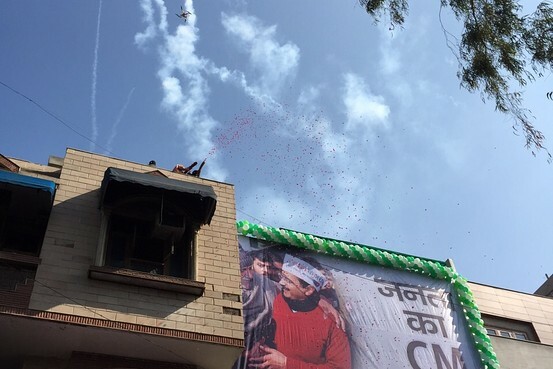 Amid a shower of flower petals and loud booms, presumably from celebratory crackers or dodgy sound system, Arvind Kejriwal speaks to supporters cheering him on as counting continues for the Delhi state election and shows the party leading in 90% of the seats. “Delhi has given us such an overwhelming majority,” he says in Hindi using the word ‘bahumat’ which is used interchangeably to describe mandate and majority. He takes a dig at the competing BJP and the Congress party. Both parties are trailing AAP by massive margins. “Today, the BJP and Congress lost out because of their ego,” Mr. Kejriwal adds. Even if the BJP can’t win the minimum seven seats needed to qualify as the official opposition leader in the Delhi state assembly, the Aam Aadmi Party will let the BJP hold the post, tweeted Kumar Vishwas, a senior AAP figure. It’s not the first time this kind of issue has arisen in Indian politics in the past year or so. Last year, when the BJP trounced the Congress party in national elections, the BJP resisted Congress’s claim to be the official opposition leader in Parliament. In that race, Congress failed to win the minimum number of seats needed to qualify. The Election Commission just flashed the Aam Aadmi Party’s first two official wins: in Adarsh Nagar, in Delhi’s north west and Ambedkar Nagar in the city’s south. 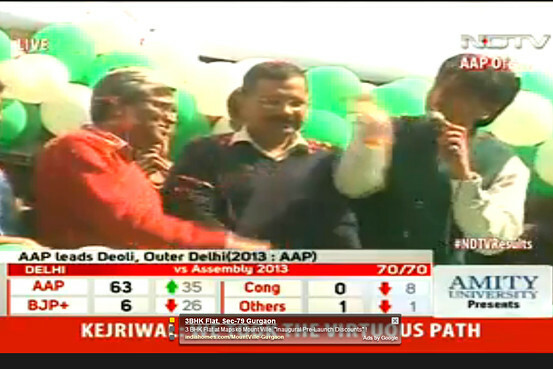 AAP’s Pawan Kumar Sharma and Ajay Dutt have won the two seats. Both Mr. Sharma and Mr. Dutt were party volunteers before they were nominated to contest elections this year. A landslide victory by the Aam Aadmi Party is a very serious reminder to the major political parties, policy makers and even India Inc. that a new aspirational class lies at the bottom of pyramid and not the conventional middle class, says Rana Kapoor, founder of Yes Bank Ltd. (532648.BY) and the president of industry lobby group ASSOCHAM. “This aspirational class are the backbone of the Indian economy but somehow has felt left out of the mainstream,” says Mr. Kapoor. They are now asserting themselves and they have no patience, he says. As Congress heads for another electoral drubbing, the party issued a statement on Rahul Gandhi’s behalf. “The people of Delhi have chosen the Aam Aadmi Party and we respect that,” said Mr. Gandhi, according to the statement. Mr. Gandhi has faced criticism for his failure to be a more public face for the party. Reliance Industries Ltd. is trading down 0.5% at 893.05 rupees. The stock started falling from 899.75 rupees at 12.09 India time, exchange data showed, just after it was clear that the anti-corruption-agenda driven Aam Aadmi Party was winning in Delhi state assembly elections. The stock has been roughly volatile in pre-noon trade. The party’s leader Arvind Kejriwal has targeted Mukesh Ambani, founder of Reliance Industries. The company has previously denied wrongdoing on its part or its chairman’s and on Tuesday declined to comment on AAP’s victory. Most of the exit polls that came out after voting ended on Saturday, correctly caught the swing of voters towards the Aam Aadmi Party but none predicted the magnitude of the popularity of the party’s candidates. Exit polls that came out over the weekendpredicted that AAP would win, with a comfortable majority with somewhere around 40 of the 70 seats of the Delhi assembly. Instead it looks like the common man’s party could win 65 seats. As the Bombay Stock Exchange rebounds, Anand Mahindra said AAP’s message isn’t anti-business. Mr. Mahindra is chairman of the Mahindra Group conglomerate. A government “promising clean governance bodes well for ease of doing business in the territory. Hence market rebounding makes sense,” he tweeted. The Bharatiya Janata Party accepted defeat as the vote-count trends showed the Aam Aadmi Party headed toward a landslide victory. “The results indicate that we failed to convey our message of development to the people of Delhi,” BJP national spokesman Praveen Shankar Kapoor told The Wall Street Journal. “We accept defeat and will introspect the reasons behind it,” he said. A market next to the Aam Aadmi Party headquarters is abuzz with news of the party’s electoral win. Arti Verma, a 19-year-old student standing nearby, agrees. “He certainly has prime minister potential,” she says. Delhi’s auto rickshaw and taxi drivers are a sizeable voting bloc. This time, they backed Congress. “We had asked our members to vote for the Congress party this time because AAP didn’t fulfill the promises they made in the last election when we had wholeheartedly supported them and they won,” said Kishan Verma, president of Federation of All Delhi Auto Taxi Transporters Congress, which has about 45,000 members. Mr. Verma said the union has already congratulated Mr. Kejriwal and is hoping that the new chief minister will implement measures such as installing CCTV cameras in various parts of the city, proper parking stands for auto rickshaws and taxis and better education of children from lower-income homes. “I’m a defeated candidate today,” says Kiran Bedi, who was the BJP’s choice for chief minister in the city. 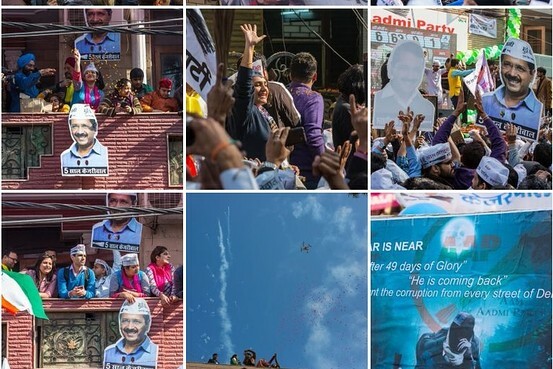 Ms. Bedi conceded defeat in the Krishna Nagar constituency where she was parachuted in just three weeks ago. What’s AAP Going to Do? Now they’ve won, what can we expect the Aam Aadmi Party to do when they take power? We read the AAP manifesto so you don’t have to. The party says it wants to cut electricity prices in half, provide clean water at an affordable price, introduce self-rule at the hyper-local level and improve safety for women. It will also create a 10,000-strong women’s security force made up of people currently working as cooks, cleaners and drivers for government officials, according to its manifesto. More on what to expect from the AAP government here. Arvind Kejriwal thanked his wife, Sunita after his victory was announced and retweeted a picture of the couple embracing after the Aam Aadmi Party’s landslide in Delhi. 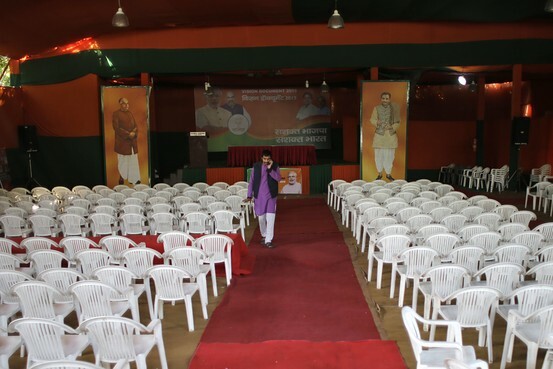 A man walked past empty seats in front of a stage set up for a press conference at the headquarters of the country’s ruling Bharatiya Janata Party in New Delhi on Tuesday. 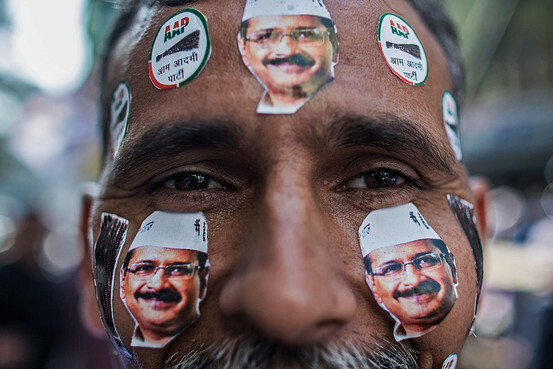 A man sported Aam Aadmi Party leader Arvind Kejriwal stickers on his face as he watched the results of Delhi Assembly Elections at the party’s Patel Nagar office on Feb. 10. You could say Arvind Kejriwal broke up with Delhi on Valentine’s Day in 2014 when he stepped down as chief minister 49 days into his five-year term. But voters have given him another chance and this year, also on Valentine’s day that falls on Saturday, Mr. Kejriwal will reaffirm his allegiance to the city when he is sworn in as chief minister once again. Mr. Kejriwal will take oath at Ramlila Maidan, an open air meeting ground, according to the Press Trust of India. The venue is the same as his last swearing-in ceremony. 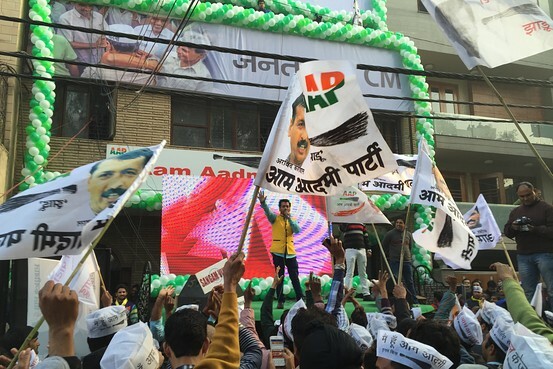 The song that defined the Aam Aadmi Party’s 2015 Delhi state election campaign can be heard blaring from speakers at the party’s headquarters where hundreds have gathered to celebrate on Tuesday. 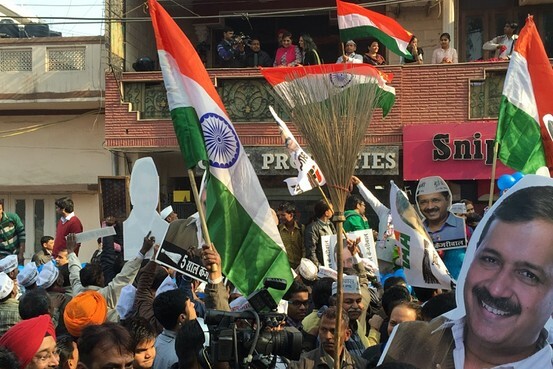 Supporters can be seen waving the Indian flag, posters, banners and brooms – the party’s symbol. 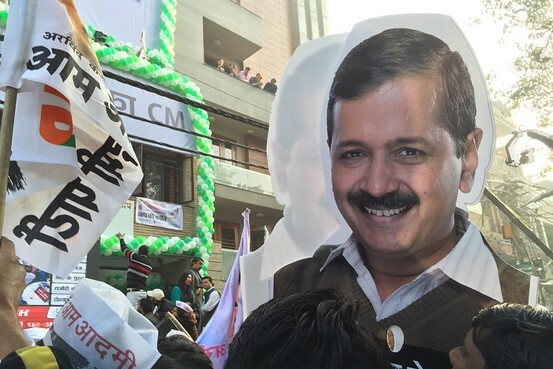 They are also holding up giant cut-outs of the face of AAP party leader Arvind Kejriwal. The song called “Five Years Kejriwal” or “Paanch Saal Kejriwal” was composed by Bollywood music producer Vishal Dadlani. From the ring tone for AAP’s phone lines to blaring from loudspeakers in the congested lanes of Delhi’s old quarters, the song seemed to be everywhere during the election campaign. Mr. Dadlani, the song’s composer said in a tweet he was boarding a flight from Mumbai to Delhi to join celebrations after it become clear that AAP was set to win the state polls by a landslide. Indian shares recovered from early losses as investors have already factored in the win of Aam Aadmi Party in the Delhi state elections. The benchmark S&P BSE Sensex is now trading up 0.6% at 28,395.75 after falling as much as 0.6% in early morning trade. “The AAP impact is gradually fading out and investors are shifting their focus back to reforms process and the Budget session,” said Neeraj Dewan, director at Quantum Securities. The Sensex index had lost 5% in the past one week after exit polls showed Bharatiya Janata party will likely lose the Delhi election. However, some of the stocks related to billionaire Ambani brothers were still trading lower as AAP’s leader Arvind Kejriwal had targeted them previously. Reliance Industries Ltd. was down 1.5%, while Reliance Infrastructure Ltd. fell 0.2%. Delhi has witnessed the birth of planet AAP today. The party, at 4.55 p.m. had won 66 seats and was leading in the one remaining seat. BJP won in three seats. Delhi’s assembly has 70 seats. 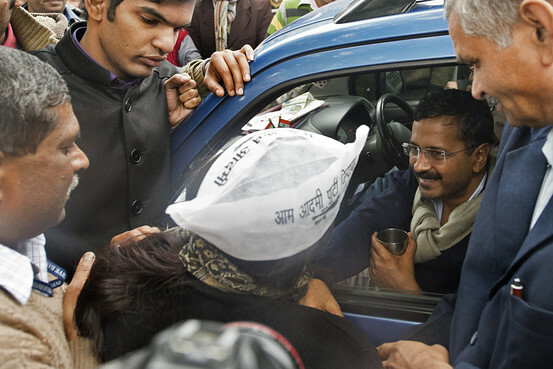 There has been a tectonic shift in Delhi’s voting patterns over the last three elections. Congress–which was the dominant player for decades, eclipsing all others with more than 43 seats seven years ago—saw its supporter base deflate and then disappear in the last two elections. The Bharatiya Janata Party had a solid foothold in 2008. 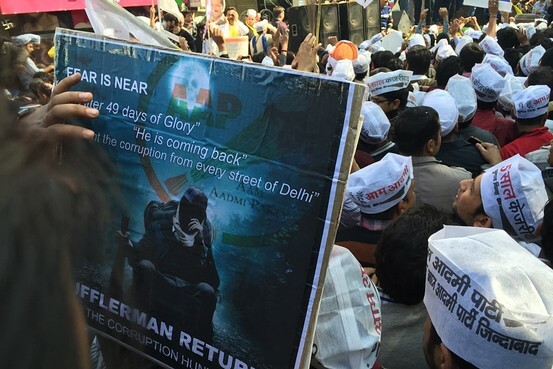 It built on that in 2013 only to be beaten back by AAP leader Arvind Kejriwal’s popularity. In the Delhi assembly this time, the BJP’s trio of assembly members is barely a moon circling around planet AAP. The AAP did not even exist seven years ago. To see just how it has expanded click here. 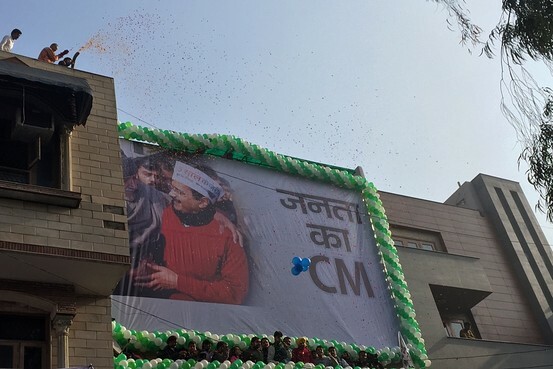 In pictures, AAP celebrates victory in Delhi on Feb. 10, 2015. That’s it folks. A momentous day for Delhi and Indian politics that saw the Aam Aadmi Party overtake the capital’s assembly with a resounding result that has left political pundits all out of adjectives to describe its significance.